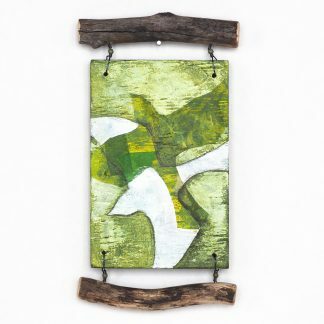 Mixed media wall hanging features an abstract bird design in coral and neutral tones on a reclaimed plywood panel. A handle made from reclaimed fence wire is laced to the panel with wire, along with vintage buttons and wooden and bone beads. Total height is approximately 11″, total width is approximately 5″. The plywood panel is 7″ high x 5″ wide.